Once a month, a small team from Arlington’s Juvenile and Domestic Relations District Court organizes social events for about a dozen or so at-risk teenage boys and girls. They’re accompanied by a team of volunteer mentors — adults who live or work in Arlington and are each paired with one of the teens. The mentors serve as an adult role model and someone the teens can confide in and learn from — often because such figures aren’t available at home. Outings are designed to build relationships between mentors and youth and have included group cookouts, mini golf, local college visits and bowling nights. Recently, the program held an event on the basics of professional dress and self-esteem, where the boys visited a men’s clothing store and the girls visited a make-up store. The groups have also had dinners together where they learned about dining etiquette and worked on their conversational skills. It’s all part of the Court’s relatively new R.I.S.E. mentoring program — R.I.S.E. standing for Respect, Integrity, Self-Esteem and Empowerment. Its main goal is to provide an early intervention to help keep at-risk teens out of the juvenile court system. Three of the court’s staff — Erika Yalowitz, Intake Officer, Tim Coffman, a Probation Officer, and Shany O’Donnell, Executive Assistant to the Court’s judges — run the program, planning outings and coordinating the volunteer mentors. To learn how you can become a R.I.S.E. volunteer mentor, contact Program Coordinator Erika Yalowitz. Or, if you want to support this year’s soccer tournament, contact Robert “Tito” Vilchez. Financial donations can be made to The Friends of Argus and Aurora Houses (501.C3), c/o Arlington Juvenile and Domestic Relations District Court, 1425 N. Courthouse Rd., Suite 5100, Arlington, VA 22201. R.I.S.E. has no formal budget from the County, aside from the staff time that Yalowitz, Coffman, O’Donnell and others dedicate to it, in addition to their regular jobs. Providing monthly social activities, which serve as mentoring and bonding opportunities, relies on donations of time, money and services from the Arlington community, including both individuals and businesses. In March, the R.I.S.E. team got some unexpected news: a donation of $15,000 was coming their way — about as much as the team would spend on monthly activities for three years. The donation came from the Darla C. Ellis Memorial Fund, set up in memory of the former Falls Church school teacher and counselor. Ellis passed away in 2017 and wanted a portion of her estate to benefit young people in Northern Virginia. The attorney working on that portion, Lamya Moosa, connected with Courtney McCarthy, a local attorney who serves on the board of Arlington’s Friends of Argus and Aurora Houses. Argus House and Aurora House are community group homes for at-risk teens, providing various support services to address underlying family or psychological issues. After a few discussions, including meetings with Conklin and his team, the attorneys agreed that supporting the mentoring program would be a perfect fulfillment of Ellis’ desire. Those same conversations revealed another great opportunity to help kids in need. 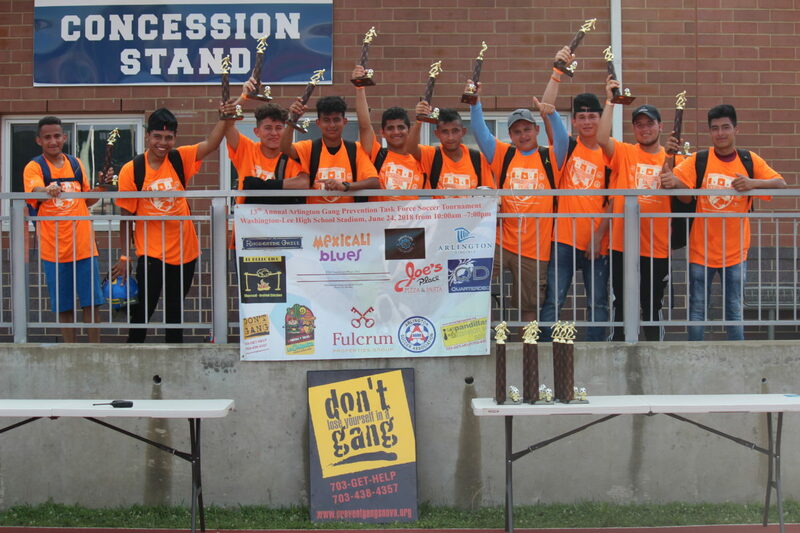 For the last 14 years, Robert “Tito” Vilchez has organized a day-long soccer tournament to show teenage boys and girls alternatives to becoming involved with area gangs. The program focuses on reaching adolescents who are more likely to face pressure to join in gang activity. It uses soccer because of the broad appeal of the sport worldwide, but especially in the Latin American countries from which many of these teens and their families emigrated. “We started this program in 2005 because we saw the return of gang activity in our area and knew we had to do something to give these kids an alternative path,” Vilchez said. At the same time the R.I.S.E team learned of its gift, Vilchez learned that one for $10,000 was coming to support the soccer tournament. The tournament reaches about 100 players a year, 10 each on 10 teams, and takes place at Washington-Lee High School, Vilchez’s alma mater. In addition to the daylong physical and competitive challenge, the tournament conveys positive messages to players and creates a sense of camaraderie and community. It also helps players meet and form connections with peers, and, in some cases, can help players form connections with other resources. RELATED: You rarely use hands in soccer. Robert “Tito” Vilchez helps kids use their heads. Vilchez highlighted an example from last year of a participant who had just moved to Arlington. During the tournament, Vilchez learned that the player didn’t know what school he was supposed to attend that coming fall. After helping him figure it out, Vilchez introduced the player to the school’s sports coaches. Today, the player starts on the school’s varsity soccer team and is on the honor roll. 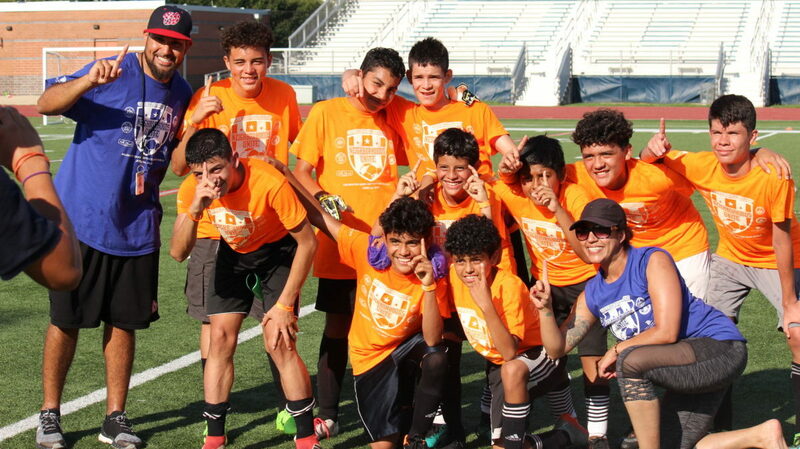 “This program is all about making connections — with peers, with positive role models, with County services and other opportunities for these players and their families to make a better life for themselves,” Vilchez said. Like the R.I.S.E. program, the annual soccer tournament relies heavily on volunteers. Vilchez says it takes 40-50 people to pull off the daylong tournament, along with donated money and resources from individuals and businesses. According to those who work on the programs, the unexpected donation is game-changing because it provides a renewed assurance that the programs will be able to continue. For R.I.S.E., the donation will allow for a few more special activities throughout the year, like one or two trips to sporting or enrichment events, or maybe even some college visits that require an overnight stay. For the soccer tournament, the donation will enable organizers to provide more ways to recognize individual players, provide more snacks and refreshments and help further build the awareness and popularity of the tournament. But the donation doesn’t dramatically change the fundraising picture for either group. Coffman and O’Donnell agreed, and said what makes the mentoring program so successful are the volunteers who give their time to be part of the kids’ lives. Arlington County launches Operation Safe Station, a multidisciplinary effort designed to connect individuals to substance abuse resources and programs.